This is a group about User Experience in the area of Utrecht. 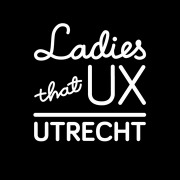 Ladies that UX is a global social enterprise with meetups in over 50 cities around the globe! We meet up every month for drinks or listen to/give presentations about UX and network with other UXers (so not only ladies, gentlemen are welcome too!). Follow us on Twitter @ladiesthatuxUTC, Instagram, Facebook and LinkedIn for UX posts, articles and event updates. Join our Slack group or Facebook group to discuss UX/design ideas, events, articles and job postings.